Entering into adulthood for women with autism spectrum disorder (ASD) involves a shift in many life systems. When preparing for the change from formal schooling to adulthood, a transition plan and support services are often provided. This is a time when students explore what life will look like as an adult. Many transition support services focus on systems that will shift including health care, benefits, daily activities, and decision making. These support services aim to help students navigate the changes and provide what is needed to be a successful, independent adult. Spending time discussing and planning for what life will look like after formal schooling ends is essential for a successful transition. However, many transition support services often leave out one very important system to consider, a social life! We all need social connectedness and to feel supported, loved, cared about, encouraged, and feel like we belong. But not belonging because we conform to what others think we should be, but truly accepted for who we are. This connection and acceptance is important to our wellbeing and is what true social communities can provide. Finding this social connectedness is critical given that adolescent females with ASD have reported lower quality of life and poor social competence compared to females without ASD, putting them at risk for developing co-existing mental health conditions (Jamison & Schuttler, 2015). Additionally, social isolation is a common experience for young people with ASD and during the transition to adulthood they experience low levels of social activities (Taylor et al., 2016). During high school, undergraduate and graduate school there are often structured opportunities for women with ASD to find social connectedness, whether through school events, sororities, clubs, student government, afterschool programs, etc. Once formal schooling ends these opportunities may be inaccessible or nonexistent for women with ASD. The best-laid transition plans can become unraveled if women with ASD aren’t happy, engaged, and connected with others who can support and encourage them after they leave the structured educational environment. This is especially true as during adolescence and adulthood social expectations and norms often change. As women with ASD establish priorities for what their adult life will look like, transition planning and support services need to place more emphasis on preparing them for how they will explore, create and maintain social and community connections. Although there are programs available to some women with ASD that are recreational and social in nature, these often focus on teaching of social skills, changing behavior, or providing habilitation services. While these programs can be beneficial and much needed for some, they may not meet the needs of all women with ASD. Whether she is interested in structured social opportunities, less structured, looking to gain more skills, gain more friends, or just be creative and spend time with others who enjoy the same or similar activities, the end goal should be the same: for her to feel connected and accepted. 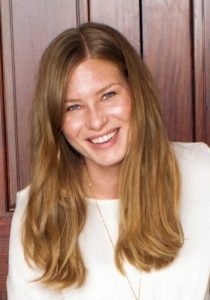 Locating social communities where women with ASD can be themselves in a safe, welcoming, flexible and accessible environment can be a critical factor in the happiness and success of women with ASD in adulthood. How do we support women with ASD in building a social circle and community connections once their formal schooling ends? While the answer to this question is complex and should be individualized for each woman, there are some common areas of importance that should be considered when supporting her. As opportunities are explored for social connections, the interests and motivation for women with ASD needs to be at the forefront. Women on the spectrum need to be heard, but you may have to listen differently. Learning about her talents, strengths, concerns, and apprehensions should not happen in one meeting. Time and patience should play a role in the process so that she can truly be at the center of planning for what her social life will look like as an adult. At Felicity House, a social community for women with ASD from 18 through old age, we learn about a woman’s likes, dislikes, talents and challenges. There is no specified time limit on how long it will take us to explore this to ensure that the woman can truly have the chance to express herself in order to create an individualized social experience. With the transition to adulthood comes pressure to be flexible with changing roles, having to multitask, and coping with shifting life systems. With flexibility being a challenge for some women with ASD, this new pressure can be exhausting. Therefore, seeking social communities that are flexible, understanding and empathetic can support women during this challenging time. 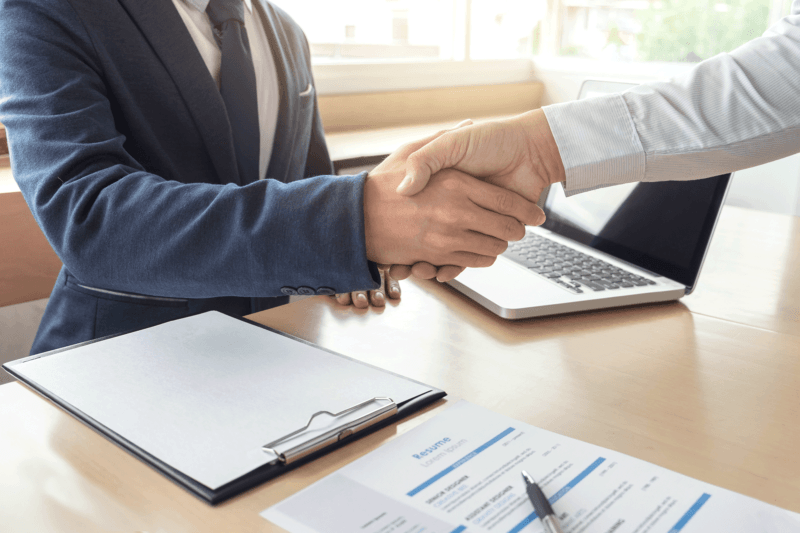 Programs and opportunities that allow women to come and go as they please, attend when it works best for them, sparks their interests, and treats them as adults will likely keep them engaged and connected. Social communities should grow with women as they age, just as friends do. At Felicity House, women can join at any time and they become community members for the long term, similar to how you would be a member of your house of worship no matter your age. In addition, social opportunities should allow participants to lead decision making and guide program content, which too will aid in their level of engagement. Exploring one’s identity can take a leap when a woman with ASD transitions from formal schooling to adulthood. This transition is a woman’s opportunity to explore her identity and the process should be an evolving one throughout her life. Our identity makes all of us individuals and helps us to better understand ourselves and to be better understood by others. When we become adults we can take steps to explore more opportunities that may not have been available until we turned 18. Certain clubs, movies, and events may now be accessible, allowing a woman with ASD to explore interests that may have previously been unavailable. Having opportunities to participate in social events that can support women with ASD in learning more about themselves, who and what they are attracted to, what brings them joy, and what challenges them can help to shape who they want to be as an adult. When looking for social opportunities we cannot forget about the basics of accessibility. How will she get there? Is it accessible by public transportation? If mobility is an issue is there an elevator? But beyond the basics we must also think about the accessibility of the people involved in the social community. If there are leaders or staff members involved are they accessible, approachable, friendly, and easy to talk to? Does the programming take into account the differences in learning or communication styles? You also want to support the woman in seeking opportunities that cover a range of interests and participation experiences. What is life without fun, relaxing, creative, intriguing and engaging activities done within a comfortable, safe environment in the company of and with the support of others? Social experiences for women with ASD can widen their social circles but also enrich their understanding on a variety of topics and areas of interest. Finding a social community that is engaging is important, but this often begins first with shared, positive experiences. 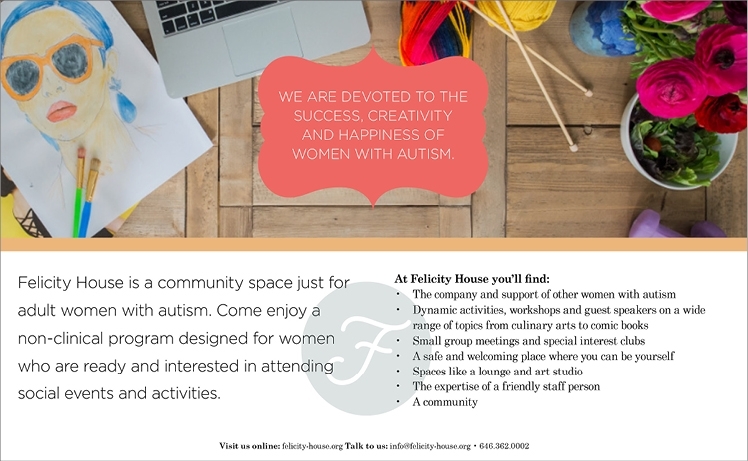 Local parks and recreation departments, alumni associations, meetup.com, adult and continuing education classes, local libraries and places such as Felicity House all provide free opportunities for women with ASD to explore opportunities for social connection. In particular, at Felicity House women are exposed to high level speakers from cultural institutions throughout New York, providing them with a rich, robust social experience. 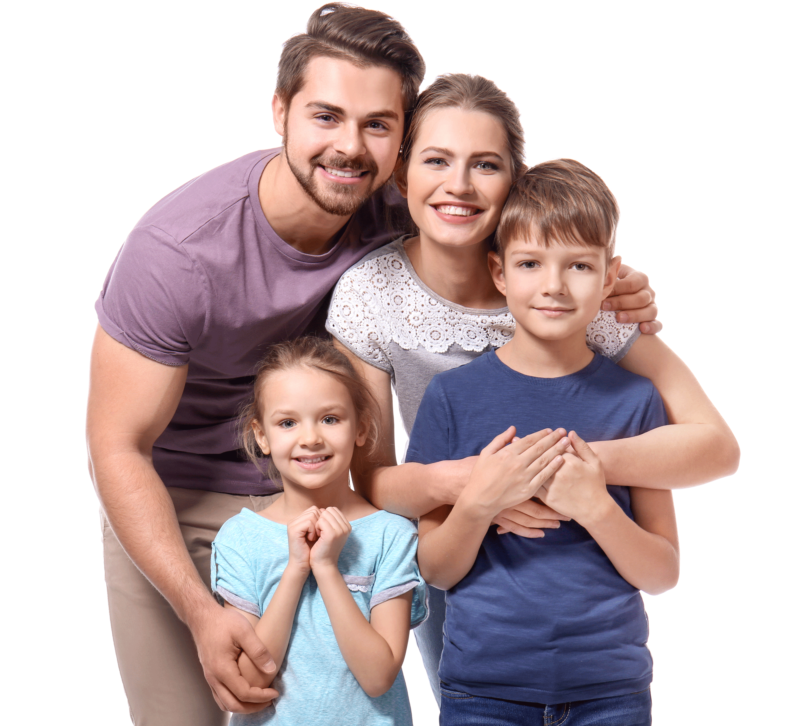 Additionally, talking to other women with ASD, parents, caregivers and other professionals can provide ideas of places to go and things to do to connect socially. The process of finding someone’s social niche can be challenging but thinking of creative and engaging ways to support women socially can be rewarding for them. Social engagement does not look the same for everyone. Each woman with ASD has her own unique desires, needs, wants and wishes for social connection. More emphasis is needed during transition to prepare women with ASD for how they will explore, create and maintain social and community connections during adulthood. Tracy Kernan, LCSW is an outreach consultant for Felicity House, a community space devoted to the success, creativity and happiness of women with autism. For more information about Felicity House, please visit www.felicity-house.org. Jamison TR and Schuttler JO. (2015) Examining social competence, self-perception, quality of life, and internalizing and externalizing symptoms in adolescent females with and without autism spectrum disorder: a quantitative design including between-groups and correlational analyses. Mol Autism 6: 53. Lounds Taylor, J., Adams, R. E., & Bishop, S. L. (2016). Social participation and its relation to internalizing symptoms among youth with autism spectrum disorder as they transition from high school. 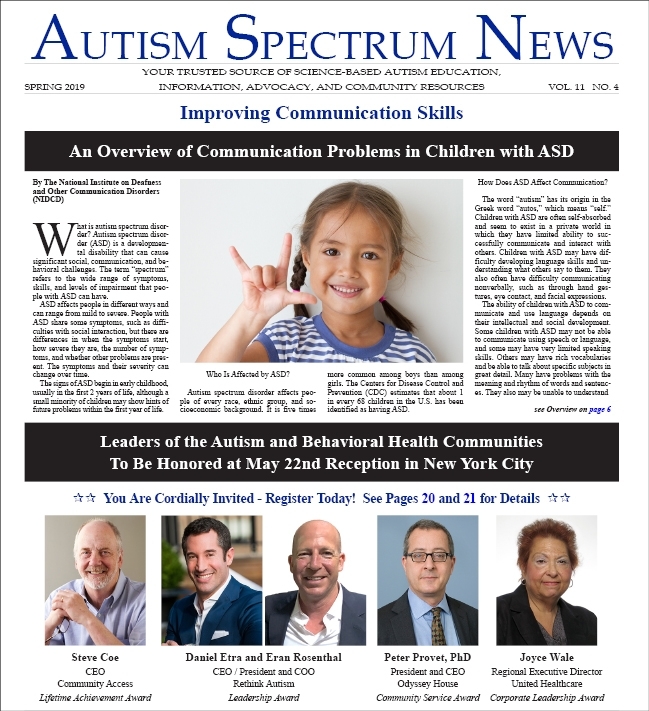 Autism research : official journal of the International Society for Autism Research, 10(4), 663-672.